“These are our few live seasons. Let us live them as purely as we can, in the present.” Annie Dillard. A reader left this quote in the comments the last time I managed to squeeze a little time out of the day to write over here. Annie Dillard is one of my all time favorites, and this, this was just right. For all of our breathing moments, for sure. But as a reminder to breathe, too. I’ve been thinking a lot this summer about seasons. About how much they dictate life on the farm, and about how disconnected they sometimes are from the reality of modern life. Not quite. Definitely not on the farm. Summer is the busiest of all the times. We take breaks, here and there, as we can, but the longer than long days are filled to the brim with work. Sun up to sun down. Five to nine, as another farmer splendidly put it. We squeeze in as much as our minds and bodies can manage, and as the children allow without reminding us that working in the dirt is not exactly play for them…even though it is for us. Thankfully. They remind us that time with friends and dips in the river are necessary parts of summer too. As well as whole days away from the beating rhythm of the farm, at the beach or in the mountains next to a sweet, quiet lake. We really do want it all, so we try for as much as we can. But the truth is, we can’t fully live in two worlds, so we mostly live and breathe farming in the summer, and I often feel this crashing together of two different ways of life throughout this season that for most people signals play, but for us signals work as play. But even more than this disjointed idea of a “summer off” that we are, by trade, removed from, the end of summer-back to school time of year feels even more disconnected from what is happening in our lives on the farm than ever. It arrives at the time when the farm is coming to full fruition for the year, and our work, though growing shorter with the shorter days, keeps up at its summer pace, if not becomes more busy. We don’t really quiet down out here until we are through September. Oh, September! The most abundant month of the year. Even though preparing ground and sowing seeds and planting transplants is busy in the spring, and a constant job up until just now, even with it done for the year, our work load is still heavy. Weeding won’t end until the rain comes in earnest. And harvesting is huge right now as summer crops ripen daily. We need more time for keeping up with that, as well as more time for selling this massive abundance of our wonderful produce, not to mention more time for preserving as much as we can for our family while this abundance is here. We are still so busy. But the schedule around us begins to change. School starts, different bedtimes are in order, different daytimes too. People seem to temporarily forget that our mid-week farmer’s market is still going on even though it is not, by their books, summer any more, and we always kind of languish a bit in our shoes, standing at our booth with the most produce of the entire year and moderately slow market traffic. The life that we lead has to be flexible and malleable in response to the natural world. It expands, then contracts. It is tempered to the reins of the physical seasons . It keeps a steady beat, it keeps a yearly rhythm, but it changes vastly throughout the year, and is in no way arbitrary nor under our control. This isn’t really how the modern, non-agricultural world keeps time. Most of the year, for most of the folks, schedules can be kept at almost the same day to day rhythm for the entire year, with only the wild and crazy mix up of Christmas and a short “summer” to temporarily detour them from that order. And there is peace to be found, for me, in her comment. I know we have chosen a way of life that is more like lives lived in the past and that feels good deep in our ancestral bones. But more than that, I really do believe that what we do out here on the farm is paving the way for the future. It feels as visionary as it is a hearkening back. It is the straddling, in the present, that is the challenge. The next eight weeks or so will only be more hectic and crazy than the rest of our already wildly busy, summer farming season because I have to divide my attention between our own summer farm schedule and the coming sooner than the farm’s “fall” schedule of our lives. The thought of it makes me feel a little weak in the knees. But, I am alive. I can still breathe. It will be, and always is, okay. I love this time of year when the harvest is so amazingly full, it only makes sense that the schedule mirror that abundance and become fuller, as impossible as that seems. The sheer putting forth of fruit from the earth at this time of year seems impossible too, but to be able to give so much in such a compressed amount of time is as simple as breathing for the earth. I am sure I can do as much too. Because after all of that fullness and hard-working and time squeezing, we do fall, naturally, into a very quiet time out here on the farm. We do come to a point in the year where we have plenty of time. We relish sitting, sitting made better because it is by the fire. And for about two months, January and February, tending the fire day and night really is almost all of the work of the day. Not entirely, of course. We do have work to do year round, but for a stretch of time, in the deep of winter, we are, nearly, still. Our schedule, although it isn’t always in step with the rest of the world, has become, for us, familiar. I don’t fight it any more with trying to mix other people’s realities into ours. It is comforting in its own steady and predictable way, even if I don’t have help at bedtime with my four children, whose bedtimes are near sundown in the summer, nor do we have a whole day off as a family aside from the couple of camping trips we do make time for in a summer. We do have a lot of down time together in the winter, a lot of time to catch up on sleep and rest. We do have lazy, winter days. This circular rhythm, we have come to know it and love it. It is marked by the plants growing outside and the hours of the sunrise and sunset. The temperature. 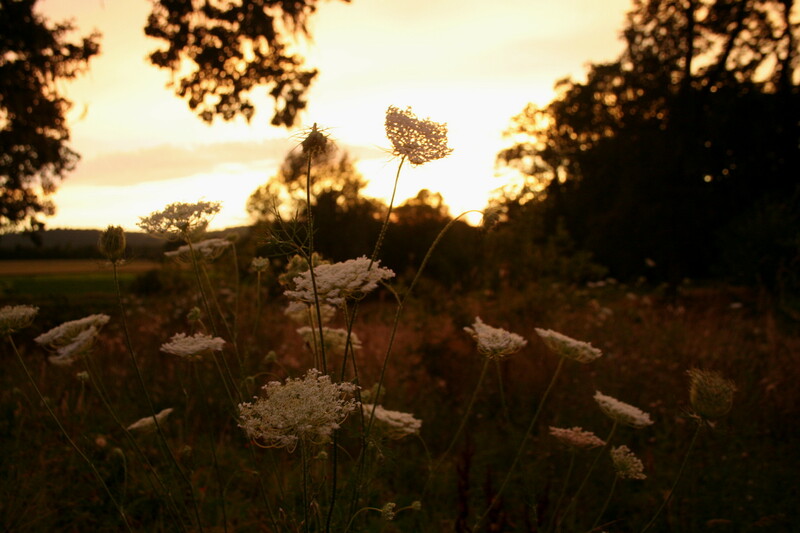 August begins with blackberry feasts in the morning and after dinner, and ends with Queen Anne’s Lace all around, catching the last rays of the setting summer. We won’t be tucking ourselves into autumn until the equinox. Or even a few weeks after that since our “summer” market season continues into mid-October. Into pumpkins and winter squash. Then, we will rest, as a farm, and the school mom shoes will not feel too tight slipped over my field shoes and my fingers, happy for the dirt under them, will likely find more time to get inky–metaphorically speaking. For now, I hold on to an imaginary handle bar. The end of the roller coaster ride of the busy farm season is the wildest, and so we will aim to make it the most fun and sweet and lively too. I’ll somehow aim to embrace the two worlds we live in by choosing this way of life, the past and the present. And truthfully, it is three worlds to embrace, to breathe in simultaneously with each breath, everyday, because through this all I am holding the small hands of the future in mine, as well.